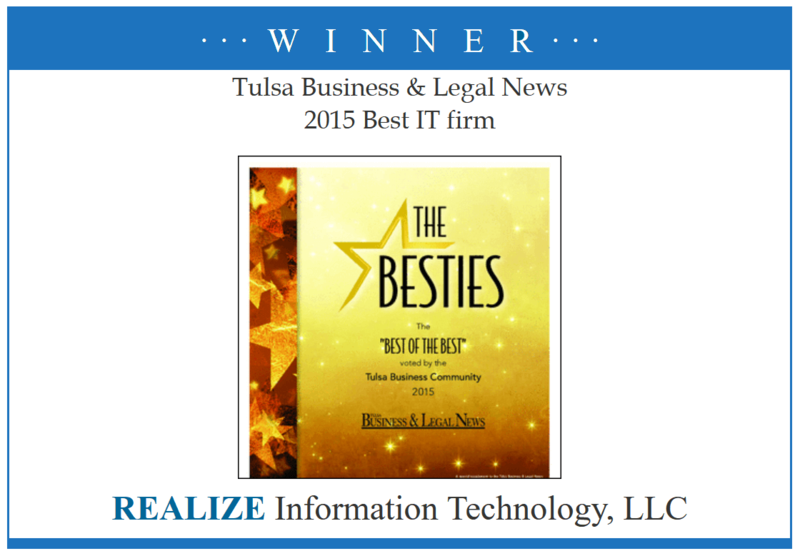 Tulsa Business & Legal News in 2015 honored REALIZE Information Technology, LLC, with the designation “Best IT Firm.” We could not have done it without our outstanding customers and staff. Here is a link to that item. Monitor and maintain servers, computers and network equipment, support for in-house IT staff, "hands on" support for corporations, simple break-fix repairs, Homeland Security clearance. Realize information Technology; the reliable tech folks. Your network must be optimized to operate smoothly. Your core software should be set of tools you can trust. We partner with Tulsa-area professionals like you. Realize Information Technology, LLC provides a wide range of IT support services for businesses in the Tulsa, Oklahoma area. Services include everything from completely managed IT environments to simple one-time repair service calls. Realize technicians will gladly work with a company’s own IT staff to supplement manpower or to bring needed expertise to the project or long-term maintenance.